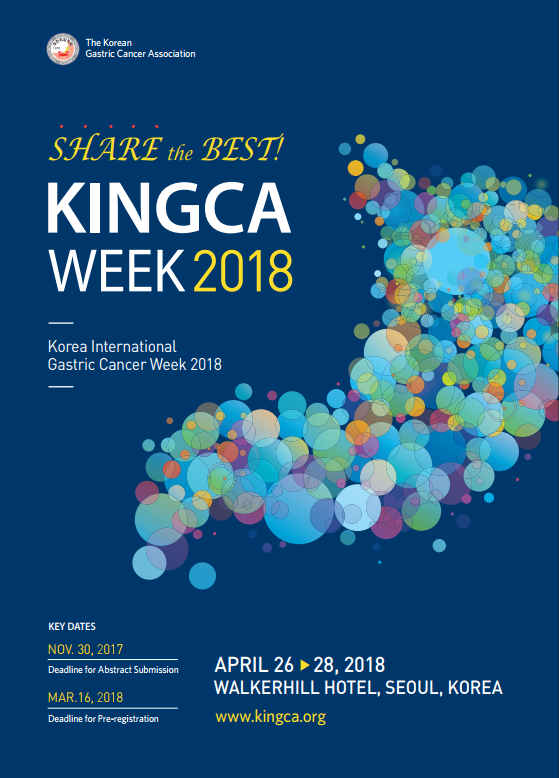 It is our great pleasure to announce that the Korea International Gastric Cancer Week 2018 (KINGCA Week 2018) will be held from April 26 to 28, 2018 in Seoul, Korea. The Korean Gastric Cancer Association has been successfully holding KINGCA Week since 2014. In a short time our attendance has grown rapidly, with KINGCA Week emerging as the one of the most authoritative scientific congresses in the field of gastric cancer. KINGCA Week 2018 is anticipating more than 800 participants from 30 different countries. We truly believe that it will be a great opportunity for your society members to get caught up on cutting-edge research trends, share valuable information and continue to build our network of specialists in our field. As our goal is to encourage and grow international collaboration research. We are sure that this will be a beneficial and unforgettable experience for all participants attending from around the world. We look forward to seeing you in Seoul, Korea!